I came, I ate, and I rocked the fork at this year’s Chicago Gourmet, the nation’s premier culinary experience! The festival, sponsored by Bon Appetit, is aimed at promoting Chicago’s dynamic culinary scene and takes place every September in Millennium Park. No wonder, the event, now in its 11th year, attracts passionate foodies from all over the country who travel to Chicago specifically for the culinary festival. The celebration kicked off with ancillary events leading up to Saturday and Sunday’s main event. On Wednesday guests partook in the Italian Feast, a one-of-a-kind Italian dinner on the Chicago Symphony Center stage prepared by top chefs. Thursday’s Blues, Brews, and Bites highlighted another Chicago gem, the Blues, celebrated by musically talented chefs who can get down on the stage and the kitchen. Hamburger Hop on Friday had guests grooving to throwback jams while chefs competed for the title of best burger in Chicago! There were even after party events and a morning yoga brunch. The ancillary events created many opportunities for everyone to take part in the festivities, especially if one couldn’t make the weekend’s main events. The main event at Millennium Park featured two stages with live cooking demonstrations, two spaces featuring expert seminars, over 250 gourmet tastings, Book signings by internationally renowned chefs, master sommeliers, and winemakers and over 600 different wines and spirits for guests to enjoy throughout the park. I started the day off at the chorizo cookoff with chefs Rick Bayless and Diana Davila, They both showed that easy 15 minute meals could be delicious, and impress the family. I made Chef Davilla’s molletes for my husband and son for brunch, and my husband requested that I make it every Sunday. I’ll be sharing that recipe here soon. Her restaurant Mi Tocaya Antojería is located in Chicago’s Logan Square neighborhood and was named one of Bon Appetit’s Best New Restaurants in 2017. If you attend Chicago Gourmet, I recommend that you have a plan mapped out. The lines can get pretty long, but with a little pre-planning, you can hit all of your favorite spots. Pro Tip: Get there early and head straight to the seafood tent. That was my plan, but I got distracted and didn’t make the first tasting. I did, however, make it for the changeover later in the day though. The sushi from Kamehachi was incredible. Also, a wine lanyard is a must! It got tricky balancing my wine glass with a plate of food, although the plate design was smart. At the end of the day, I realized that I didn’t have ANY dessert all day! I will plan better next year. Even for the most enthused foodie like me, it was impossible to hit up every booth, but I’m proud to say I put forth my best effort and created a beautiful food baby. I had an amazing time, and I highly recommend adding Chicago Gourmet to your foodie bucket list! This was my first year in attendance at Chicago Gourmet, and I’m already planning for next year! 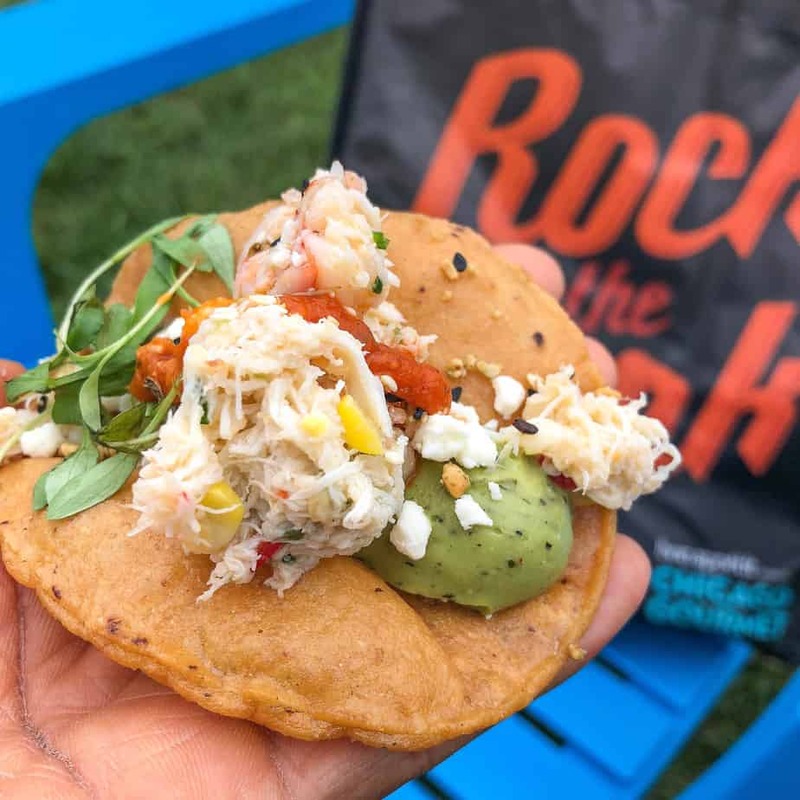 Save the date for Chicago Gourmet 2019 Sept 27 – 29, 2019!